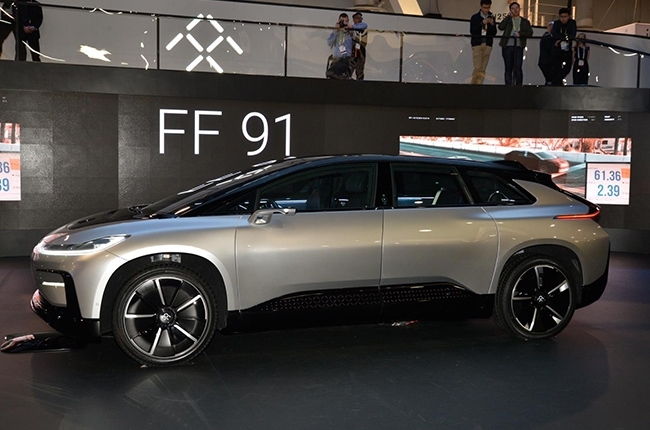 Start-up company Faraday Future revealed its first production vehicle FF 91 (“nine one”) at the 2017 Consumer Electronics Show (CES). The “nine one” is built upon the Variable Platform Architecture (VFA) and said to combine the qualities of a luxury vehicle and the performance of a supercar. Equipped with a 130kWh battery, which enables it to produce 1,050 hp, the FF 91 is able to perform 0 to 97 km/h in just 2.39 seconds – stepping ahead of its rival Tesla Model X. With this, the FF 91 is also the fastest accelerating electric vehicle (EV) on the planet. More so, the FF 91 is also said to have the fastest charge speed, charging at 805 km/h, whereas the home charger can charge from 50 to 100% in under 4.5 hours at 240V. Outside, it may appear that aerodynamics heavily influenced its exterior design. This is due to the UFO line found on the mid-section of the car. This feature is a stabilizing element, which helps the car attain a supercar-like performance with a feel of luxury. Also evident is its sleek and rounded front end, while the rear is seen with an edgy, coupe-like form. In addition, the FF 91’s exterior lighting focuses more on communication between the car and the driver. As an example, one feature is the illuminating ability of the car’s rocker panel whenever the owner approaches the car – giving the impression of welcoming its owner. Interior-wise, the vehicle was able to attain a spacious cabin with the wide vehicle stance and long wheelbase. The car features rear-seat reclining angle, providing lower leg, lumbar, and upper back adjustments and support. On top of that, the panoramic roof and windows are easily dimmed with a tap of a finger on the glass – thanks to its Polymer Dispersed Liquid Crystal (PDLC) technology. 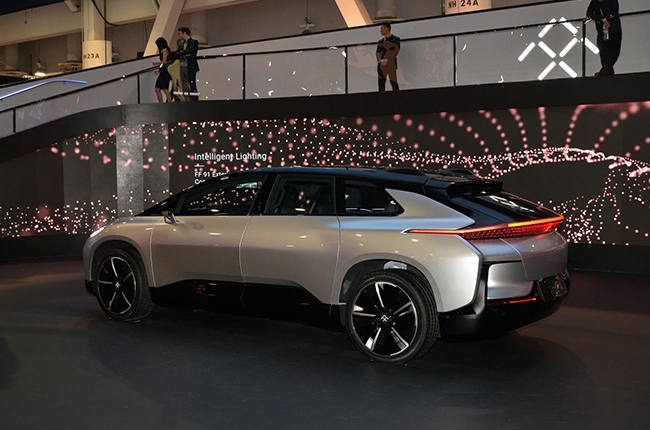 Aside from the car itself, Faraday Future also introduced its global FFID. This system recognizes personal preferences like usual seating positions, favorite music, ideal temperature, and driving style to ensure a personalized driving experience, a feature that can also be found on the Chrysler Portal concept. The FF 91 also features facial recognition system used to unlock its doors. 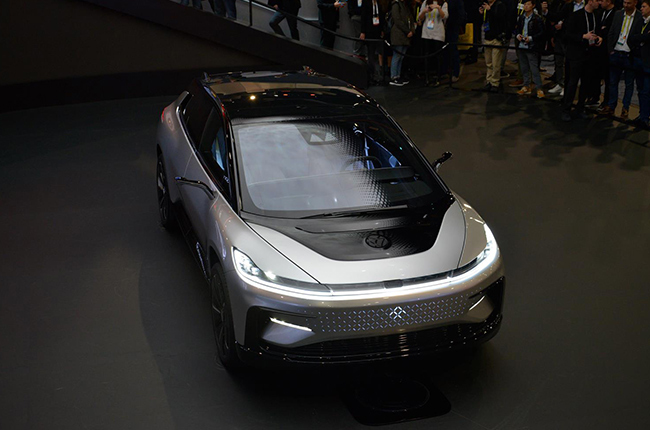 Even more, the car is integrated with a retractable 3D lidar for autonomous driving, along with 10 HD cameras, 13 long and short range radars, and 12 ultrasonic sensors. These make the Driverless Valet parking feature possible, which parks the car after the driver leaves the vehicle. Meanwhile, the FFCTRL app enables the driver to summon back the car from where it is parked, as well as schedule a desired time and pick-up point. Currently, the FF 91 can park itself at private parking lots. Also adding to its high-tech features, the rearview mirror has been replaced by an HD display that merges side mirrors live feed and rear view cameras – it’s not just a mirror anymore. Although production is scheduled to take place sometime in 2018, Faraday Future said it will start accepting reservations through their website, FF.com. In addition to this, the first 300 orders are entitled to have the opportunity to upgrade to Alliance Edition, an exclusive launch series, which will also be auctioned at a gala in March 2017.